Our collection, 17 Slow Cooker Buffalo Chicken Recipes You Need To Try Right Now, is packed with slow cooker buffalo chicken recipes that are so good, you've got to try them right away! Your slow cooker is the ideal tool for cooking up tender, juicy, and flavorful buffalo chicken, which can be used for a variety of dishes. 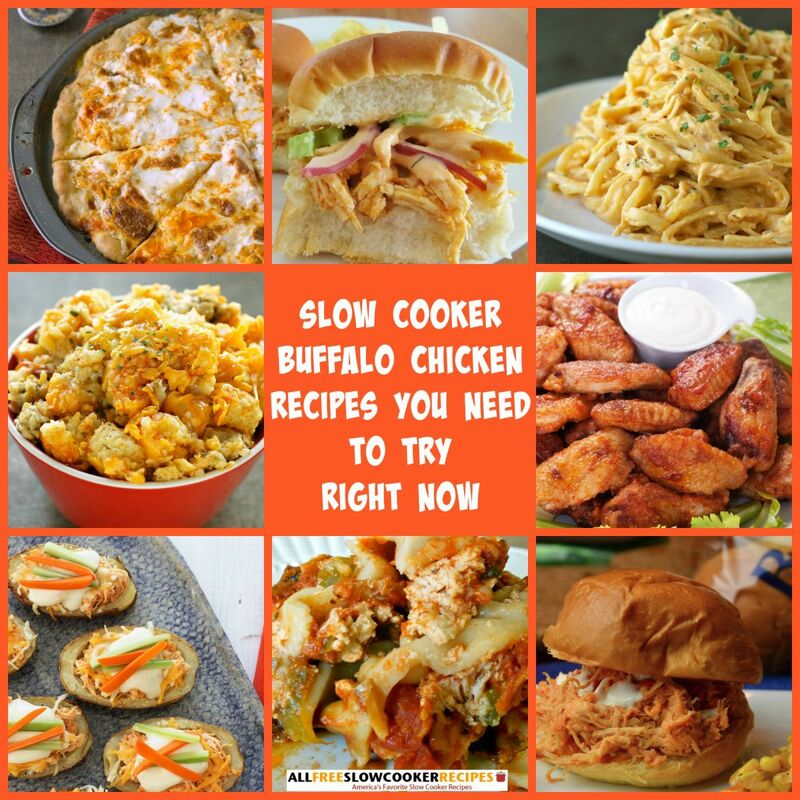 We've highlighted some of our favorite slow cooker buffalo recipes in this collection to give you some creative ideas. Inside, you'll find traditional recipes for slow cooker buffalo shredded chicken, slow cooker buffalo chicken sliders, slow cooker buffalo chicken sandwiches recipes, and slow cooker buffalo wings. You'll also find more unique options, such as our slow cooker buffalo chicken lasagna recipe, as well as our slow cooker buffalo chicken dip, slow cooker buffalo chicken chili, our slow cooker buffalo chicken wraps recipe, and more. Whether you're planning a game-day platter, or just want weeknight meal idea with a kick, these slow cooker buffalo chicken recipes won't disappoint. You can use slow cooker buffalo chicken in so many dishes--the possibilities are endless! We're particularly excited about our Buffalo Wing Soup, Buffalo Chicken Potato Skins, and Buffalo Chicken Pizza below. You might not think those dishes could come from the slow cooker, but they do! All Day Shredded Buffalo Chicken (shown above) - This recipe for shredded buffalo chicken is perfect for sandwiches or wraps. It's a quick slow cooker buffalo chicken recipe made with chicken thighs, buffalo sauce, and ranch dressing. You can customize it with your favorite buffalo sauce, ranch, or blue cheese dressing. Slow Cooker Shredded Buffalo Chicken - Only 5 ingredients make this a super simple way to serve dinner on any given weeknight. Serve up this slow cooker buffalo shredded chicken on a sandwich bun or use it for another recipe of your choosing. Slow Cooker Buffalo Chicken Sliders (shown above) - If you're in search of a buffalo chicken sandwiches recipe that's good for entertaining, you're in luck with this recipe for Slow Cooker Buffalo Chicken Sliders. These mini sandwiches are packed with flavor, and perfect for a party or game day gathering. Slow Cooker Buffalo Dip - This slow cooker appetizer doesn't take long to cook -- only 1 hour! It's packed with flavor, made with chicken, cream cheese, hot sauce, ranch or blue cheese dressing, Cheddar cheese, and more. Game Day Buffalo Chicken and Ranch Sliders - This super easy party dish only takes about 20 minutes to throw together before you throw it in the slow cooker to finish the job, leaving you to enjoy the game as well. For more tasty slow cooker chicken recipes, download our free eCookbook, "Slow Cooker Chicken: 16 of Our Best Slow Cooker Chicken Recipes." Buffalo Wing Soup (shown above) - Buffalo Wing Soup is one of the most interesting slow cooker soup recipes you can find because it is reminiscent of your favorite wild wings recipes. Slow Cooker Buffalo Chicken Chili - Made with buffalo wing sauce and topped with blue cheese, you can't go wrong with this slow cooker buffalo chicken chili recipe, reminiscent of classic buffalo wings. Slow Cooker Spicy Hot Wings (shown above) - Good buffalo chicken wing recipes are great to have on hand, and with this easy slow cooker chicken wings recipe, you will have one you can turn to any time. These Slow Cooker Spicy Hot Wings are so tasty, you'll have no trouble gobbling them up. No-Mess Slow Cooker Buffalo Chicken Wings - This is an awesome slow cooker buffalo wings recipe with so little clean up, you'll wonder why you've never done it this way before! Slow Cooker Spicy Buffalo Chicken Sandwiches (shown above)- If you like buffalo wing sauce recipes, you'll enjoy this Slow Cooker Spicy Buffalo Chicken Sandwiches recipe, which only takes 4 hours to cook. Four-Ingredient Buffalo Chicken Wraps - This recipe for Four-Ingredient Buffalo Chicken Wraps is a shredded buffalo chicken sandwich recipe that's super easy to prepare. Once it's done, wrap it up in your favorite tortillas with spinach or lettuce. Six Hour Slow Cooker Pulled Buffalo Chicken Sandwiches - If you're looking for slow cooker recipes for chicken that will wow your family, try this recipe. This tangy chicken is a fun take on the traditional pulled chicken sandwich. Want more game-day inspired foods? Visit our collection, "20 Incredible Game Day Food Recipes For The Big Game." Buffalo Chicken Lasagna (shown above) - This recipe for Buffalo Chicken Lasagna puts a whole news spin on the traditional slow cooker recipe for lasagna that you'd normally expect. It's made with chicken breasts, pasta sauce, buffalo wing sauce, bell peppers, and more. Buffalo Chicken Tater Tot Casserole - This casserole stays moist and cheesy with help from olive oil, buttermilk, and shredded Cheddar cheese! Spicy buffalo wing sauce takes the flavor up a notch, and crunchy carrots, celery and crispy tater tots make for great texture. Buffalo Chicken Potato Skins - Fill each potato skin with delicious buffalo chicken, and then top each potato skin with cheese, blue cheese dressing, and chopped celery for a slow cooker appetizer recipe everyone will love. Slow Cooker Buffalo Chicken Pizza - The chicken recipe, itself, calls for only 3 ingredients: boneless, skinless chicken breasts, chicken broth and buffalo wing sauce.This buffalo chicken pizza recipe is a must-make and is sure to become a new favorite. Slow Cooker Cheesy Buffalo Chicken Pasta - This recipe takes a classic buffalo chicken pasta and jam packs it with gooey cheesy, goodness. This is a truly delectable pasta meal, with enough buffalo wing sauce to make fans of all things spicy start salivating.